Hotel is 100PCT Non-Smoking. 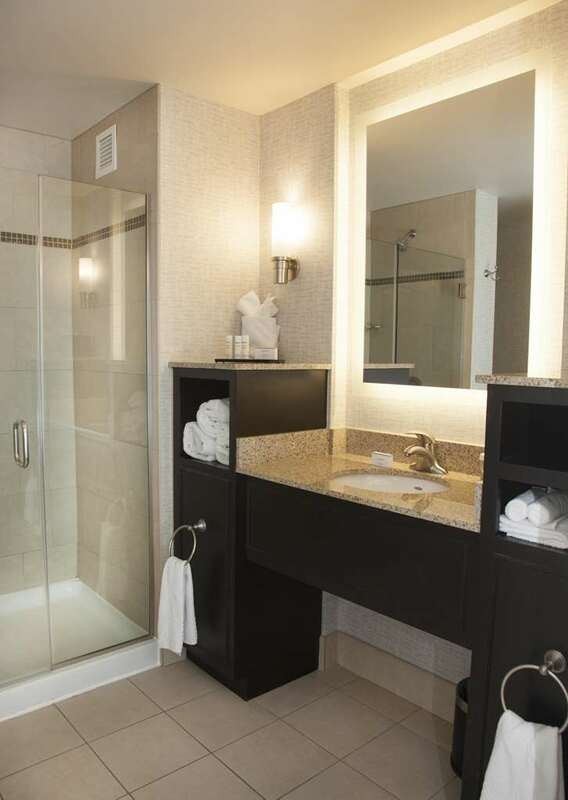 The new Embassy Suites Columbus - Airport hotel in Columbus Ohio is the premier full service hotel near Port Columbus International Airport and a preferred choice for business travel Columbus vacations and convention guests. Our hotel is conveniently located 4 miles from Easton Town Center a multi-faceted entertainment and shopping complex 6 miles from downtown Columbus and the Greater Columbus Convention Center and 10 miles from The Ohio State University. Hotel Features Luxurious and spacious two-room suites with living room and private bedroom - some with skyline or airport views. High-speed Internet access sofa sleeper microwave mini-refrigerator coffee maker laptop safe luxurious bath amenities and two 42* flat screen televisions in all guest suites. Complimentary full cooked-to-order breakfast provided to each guest daily. Complimentary nightly Manager*s reception featuring your favorite snacks beverages and cocktails. Flying Spoons our full service restaurant proudly brewing Starbucks coffee and sweet treats. Fully-equipped complimentary Business Center. State-of-the-art Precor Fitness Center and heated indoor pool whirlpool and sun deck. Complimentary airport shuttle from 430am - 1200pm daily. Complimentary shuttle service to Easton Town Center. The new Embassy Suites Columbus Airport hotel is one of the most efficient venues for a distraction-free environment for meetings events weddings Bar Mitzvahs and holiday parties. The hotel boasts over 12 000 square feet of flexible function and foyer space where all of our function rooms are equipped with a drop down screen and LCD projector. Our Upper Arlington Boardroom is pre-equipped for video and teleconferencing events. Whether visiting Columbus for business leisure sports or a convention the new Embassy Suites Columbus Airport hotel is a central location to all Columbus has to offer.